Common Core standards were written and adopted without public debate or even public knowledge. 45 states adopted Common Core in2011… But in 2013, 62% of Americans said they had never heard of Common Core. Common Core takes all control away from local school districts and states: states cannot reform the standards because they’re copyrighted, and they are only allowed to add 15% of requirements to Common Core’s standards. It also takes away the liberties and rights of parents and students. Parents who want to give their kids a different education – at a Christian private school or perhaps through homeschooling – are still caught in the traps of mandatory Common Core testing. All schools and students will be assessed by Common Core tests – so if they want to receive funds, graduate high school or get into college, they will have to adopt “Common Core aligned” curriculum so they can do well enough on the tests. Under a stimulus bill in 2009, state databases are now required to track student religious affiliations, family voting status, health care history, disciplinary records, and more… from pre-school through college. And, when states adopted Common Core, they agreed that all student data collected at the state level will be given to the U.S. Department of Education. Math: Dr. Milgram, Stanford Emeritus Professor of Math and the only mathematician on the Common Core Validation Committee, refused to sign off on the standards. The math standards use new methods that are not supported by any research and contradict those of high-achieving countries. Students and parents are already bewildered and frustrated: students can’t grasp these methods, and parents can’t help their kids. Science: The pro-Common Core Fordham Institute gave California’s science standards an “A” rating (10/10) and Common Core science standards a “C” rating (5/10). English: The only English scholar on the Validation Committee also refused to sign off on the English standards. (1) In AP U.S. history, the U.S. Constitution is undermined, negative parts of American history are emphasized at the expense of the good parts, and American principles aren’t taught. (2) The science textbooks are filled with unscientific, environmentalist propaganda. (3) The health standards – largely developed by Planned Parenthood – have kids learning sexuality skills from kindergarten to 12th grade. Here is just one aspect of the Common Core tests that is problematic and unfair. Though there are many problems with the tests’ implementation, this one is part of its design. The tests are not standardized. They are computer adaptive: When a student gives correct answers, the computer will feed harder questions to that student. When a student gives wrong answers, the questions will get easier. 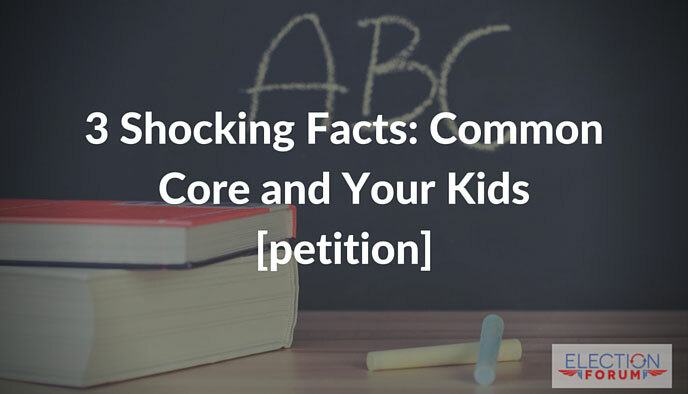 Sign our petition to fight Common Core, here. And watch out for upcoming articles on Common Core. We’ll explore these topics more in depth, show the presidential candidates’ positions on Common Core, and more.